Tartar is hardened dental plaque that affects almost 68% of adults. Tartar buildup is a major problem, as it can lead to bad breath, gingivitis, and cavities. If you continue to allow tartar to build up on your teeth, you may eventually need to have teeth removed or capped. It is best to take good care of your teeth and to see your dentist regularly in order to avoid the buildup of plaque and tartar that might negatively affect your oral health. To avoid tartar buildup, include these tips and tricks into your daily routine. The best thing you can do for your teeth is to see your dentist on a regular basis. Even if your teeth are perfectly healthy, you should schedule appointments every six months so that your dentist can catch any minor problems before they become any worse. A professional dental cleaning is a major factor in preventing tartar buildup. It may sound like a no-brainer, but brushing and flossing are the most important things you can do to promote the overall health of your teeth, both now and for years to come. Use an anti-plaque fluoride toothpaste for the best results when it comes to fighting tartar. Brush your teeth at least twice a day, and floss at least once a day. Getting in between your teeth when you floss helps you to get rid of the difficult-to-see plaque that tend to build up quickly if you aren’t flossing. Flossing also helps to remove food particles that could be harmful if you let them sit in your teeth. Electric toothbrushes can go a long way in helping to prevent plaque buildup, but you must be sure to change the head every three months for optimal performance. If you don’t like electric toothbrushes, just be sure to find a quality manual toothbrush and to replace it every three months. If the bristles begin to wear down before that time period, replace it anyway, as they will not be as effective and cleaning your teeth and removing plaque. 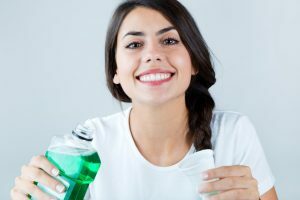 Rinsing with mouthwash is an often-overlooked task that greatly helps to reduce the amount of your plaque and to prevent tartar buildup. Doing so helps wash away current plaque and kills bacteria that may lead to the growth of new plaque. Mouthwash also leaves your mouth feeling fresh and clean after brushing and flossing. Smoking or consuming an excessive amount of sugary foods can lead to excessive plaque buildup which will ultimately become tartar. Try to stay away from soft drinks and foods such as cakes, candy, and other sweets that are high in sugar. Sugars are breeding grounds for bacteria, and the buildup in your mouth can lead to plaque that may cause more serious oral health problems down the line. Prevention is one of the keys to remaining tartar-free. It’s important that you do your part to keep your teeth free of plaque and tartar! Schedule an appointment today at Advanced Dental Care of Twin Falls to make sure that your teeth are clean and that any existing issues are dealt with. Between appointments, keep the above steps in mind to keep your mouth healthy and your teeth strong.